By avoiding an 'all-rounder' design Violet have created a unique mic that can add weight to a recording. Rich, warm sound. Has its place in a larger collection. No option to adjust internal headroom of the mic amplifier. The Atomic is a neat, simple and robust large diaphragm condenser microphone that proves lighter than it appears. This is partly due to the transformer-less head amp design, which is class-A discrete, ie does not use IC op-amps. Coupling class-A amplification with a transformer-less output is beneficial for minimising distortion and phase shift, as well as mass, with the added bonus of lower production cost: a transformer worth putting in a microphone, where benefits to decoupling, impedance matching and S/N ratio outweigh additional weight/housing volume, can seriously change this value. The Atomic has no onboard controls, such as high-pass filter or pad, which again keeps things light, simple and cheap. The downside is that the internal headroom of the mic amplifier cannot be adjusted to prevent distortion in high-SPL, loud LF situations. The specs for the Atomic are respectable in this regard, though we didn't get to try anything louder than a guitar amp, which it handled without audible distortion. At the other end of the scale, the Atomic is a quiet mic and you'll be as likely to hear your mic preamp noise floor as much as this mic's. The Atomic does have a weighty low-end response and so the decoupling from impact transmission is minimal, making a preamp with low-cut essential, and we'd also recommend using a shockmount. The Atomic is billed as a 'warm' mic, which it certainly is. The richness of the low frequency response is pleasing on many sources, especially voice, and it does not appear to exhibit any unwelcome resonances in this region, ie the response 'curvature' is smooth. Frequency response is a relative property, and so this richness is balanced by a less forward mid frequency range. At the top of the range there is a peak and this occurs just past vocal sibilance, though well beneath what many refer to as 'air'. The result is an intimate sounding mic that really sits a voice forward of the room without over emphasising the 'esses' and breath. This can help add body to voices and acoustic instruments, as well as capture bass instruments without having to cut away unwanted upper frequency components. The flipside of this is that mid-focused sources need EQ-ing into shape, and resonant body instruments that need MF and HF presence can come across rather boomy, especially acoustic guitar. Playing with distance can help mitigate this. This is not an 'open' sounding microphone, a characteristic that in combination with its cardioid pickup pattern can be useful for vocal recording in reverberant spaces. Coupling it with a good quality reflection filter reaps rewards for a dry upfront vocal. Though the HF peak is out of the sibilant range, it does feel a little narrow, so if the source lacks harmonic content within this window it can sound rather dull. 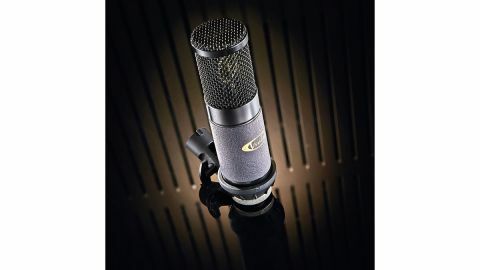 The Atomic is a well-made mic at a relatively low price. It has a distinct characteristic, which makes it a little limited, but it would definitely see regular action within a larger collection where a darker mic is often called upon to balance the prevalent mids/highs from other mics. Voice and bass instruments (acoustic and amplified) are the Atomic's key areas, where proximity can be used creatively to bring out body and weight without reaching straight for the EQ. Conversely, liberal application of low-cut or high-pass filters will render a source without the harshness that can often accompany low cost in condenser microphone design. Finally, the Atomic, coupled with a quality preamp, can take a heap of EQ without breaking up, which is indicative of low/smooth phase shift, and that's always good.